Hawkman found is the first book that Jeff Lemire is writing now that he has returned to work for DC Comics and I must say that the book is pretty good. Jeff Lemire is one of my favorite writers, so I was definitely looking forward to this. 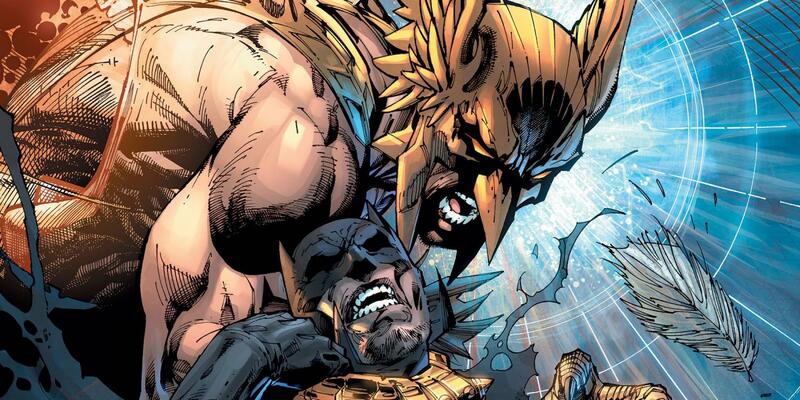 In Dark Nights Metal #4 we saw the huge Hawkman monster and this book serves to give us some context and explain how Hawkman ended up like this. This issue basically utilizes the origin of Hawkman, as a caveman to illustrate him soaring and succeeding. This is definitely a very hopeful aspect of the book. Even the title found suggests that this could be Hawkman fighting back and defeating Barbatos’s corruption, however as you read on the story is more sinister. At the heart of the book, it is about despair. He continues to soar, but when he feels that he has finally succeeded he comes crashing back down, and that is how he is being controlled by Barbatos. He is effectively so filled with despair that fighting back seems pointless. This is especially apt considering Barbatos wants to bring the regular multiverse into the dark multiverse, which makes this issue kind of metaphorical.